It’s a little slow in the wake of the holidays, but we’ve dug around to discover a few fine events to keep you busy in the opening days of 2012. 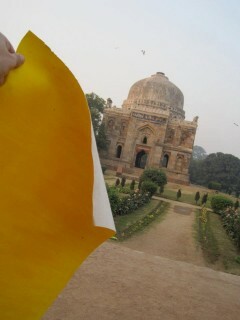 Avantika Bawa will create an installation at St. Brigid's using the same yellow vinyl shown here. Preternatural is an awesome three-venue contemporary art exhibition on the themes of nature, wonder, and spirituality. And, happily for the good people of Ottawa, it continues into the New Year with the openings of two new installations this weekend. First up, Korean artist Shin Il Kim launches the video triptych Invisible Masterpiece on Thursday, Jan. 4 with a vernissage at 6 p.m. at Patrick Mikhail Gallery on Friday, Jan. 6 (2401 Bank St.). Invisible Masterpiece is made from 708 individual pressed line drawings which Kim has animated at 30 frames per second. On Saturday, Jan. 7, a site specific installation by Avantika Bawa opens at 4 p.m. at St. Brigid’s Centre for the Arts (302 St. Patrick St.). Bawa’s minimal installation will create a synthetic and surreal environment within St. Brigid’s, overlaying bright “Indian yellow” vinyl over the architecture while filling the space with bass sounds from the key of E. Sounds dreamy… For full details on what’s up with Preternatural, visit www.preternatural.ca. Let the weekend begin early! On Thursday, the Company of Fools (fresh off their stellar run at the GCTC) celebrate the end of Christmas and the beginning of a new year with their annual Twelfth Night Celebration at the NAC’s Fourth Stage. Expect music, mirth, and mayhem as the Fools reinterpret Shakespeare’s classic comedy. A sell-out every year, the night also features short scenes and snippets of what Company of Fools followers can expect in the coming year – plus some blasts from the past. $24. Thursday, Jan. 5, 7:30 p.m. 53 Elgin St. www.nac-cna.ca. Here’s one for the kids. The Canada Science and Tech Museum invites its audience to step into the 19th century to celebrate a Victorian holiday packed with revolutionary technologies from the era. Kids can discover inventions that changed the world through hands-on activities that let them imagine what it was like to be a Victorian scientist or telegraph operator. Be dazzled by an illusionist or learn how medicine was practiced more than a century ago. Walk in the footsteps of famous sleuth Sherlock Holmes as you attempt to solve the mystery of the disappearing artifact. The event runs daily from Wednesday, Jan. 5 through Sunday, Jan. 8. www.sciencetech.technomuses.ca.